Your Sunday worship service is the hub for other activities at your church. It’s the main event. It’s the gathering for your entire church. It would make sense that you would want to pour the most time, energy, and money into creating this experience. It’s also the event you should spend most of your time planning. Your Sunday worship gathering is where you invite guests to, it’s where you teach, preach, and worship the most. I know that a lot of your planning as a church media director is reliant upon your senior pastor working ahead. When I speak to groups of pastors, this is one of the main things I challenge them on. But you can take some initiative and be proactive in planning with your senior leadership. Don’t be afraid to let them know what you need to be successful – after all, you’re all after creating an amazing experience. 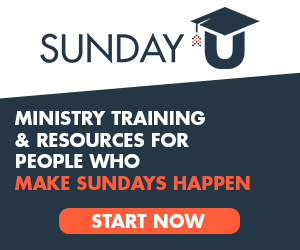 Be sure to plan your services far enough in advance for you to be able to prepare teaching content, produce video elements, prepare your band and musicians, go to press on printed materials, and everything else you need for a Sunday. Planning is a crucial piece of preparing for a dynamic, enaging service. The same Holy Spirit that can change your plan spontaneously on a Sunday morning is the same Holy Spirit that will guide you as you plan your services. 2. Take your audience on a journey. From the moment someone drives into your parking lot to the moment they drive away on a Sunday, you must take them on a journey. The experience even goes outside your auditorium. During your actual service, don’t just sing a handful of random songs and preach a message where nothing really connects and it’s not cohesive. Think through how every element affects every other element in and around your service. Let’s say you did a message series on “God at the Movies” where you take popular movies and wrap a spiritual truth around the idea of a movie. Several churches have done a series like this. Let’s say you did a Sunday using the movie “Back to the Future” to talk about how our past doesn’t define us and how Jesus can free us from our past and give us hope for the future. When pulling into your parking lot, you could have your parking volunteers wearing orange jackets like Marty McFly. You could have movie score music or the “Back to the Future” soundtrack playing on outside speakers and in your atrium as people are walking in. You could have guys doing skateboard demos in a sectioned off area outside near your entrance. Know anyone that owns a Delorean? You could have it on display at your entrance. You could have your greeters wear name tags with their name and birth year on it – “Jim Smith from 1955”. In your atrium, you could have popcorn stands with bags of fresh popcorn, you could have photo booths with people dressed up as iconic movie characters, you could have movie marquees, red carpets, movie posters, and memorabilia all around. Your pre-service loop on your screens could roll movie trivia or have your church announcements in the style of slides or trailers you would see on the big screen. Your countdown could have movie trivia, movie clips or quotes from the movie your featuring that day. Your first song could be a cover of “The Power of Love” by Huey Lewis and the News. In the style of a movie trailer with a movie voiceover. A greeting from a pastor on staff. He could come out with a Flux Capacitor prop or wearing the big helmet Doc Brown wore in the movie. He could even come out dressed as a character from the movie. Worship Set of 2-3 songs. God honoring songs that could relate to the topic of being free from our past. :30-:60 Bumper with content from the series messages and clips from Back to the Future and other movies in your series. If you’re thinking you don’t have the resources for the media content for your screens that I mentioned above, think again. 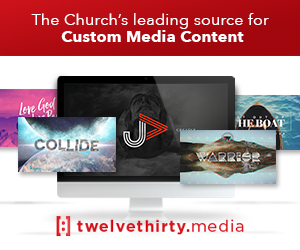 At [twelve:thirty]media, we can work with your staff to create custom media content like pre-service loops, countdowns, sermon bumpers and more tailored specifically for your series or event. 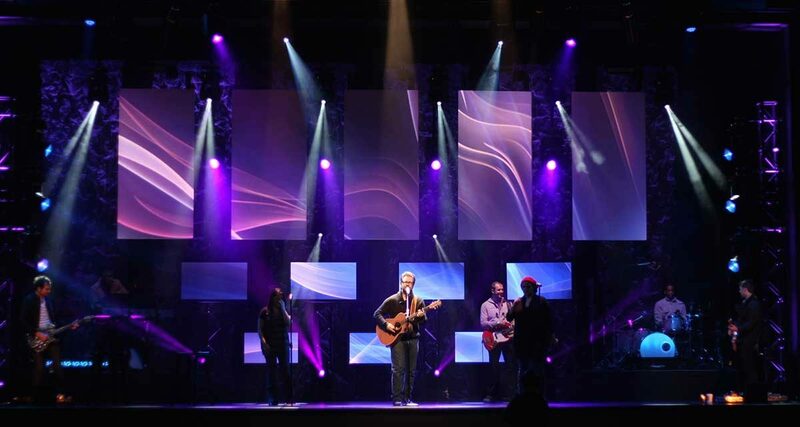 Learn more about affordable custom media for your church here. Transitions are one of the most under-planned and over looked pieces of worship services. They are key to a great service flow. Once you have your service flow or order of service in place, spend some time during the week talking through how each element of your service will transition to the next. All your key people should be included in these discussions – worship leader, pastor, welcomer, any other on-stage leaders, representatives from audio, lighting, video, and any other key people that will be responsible for the execution of your service. What time in the countdown is the band going out on-stage? How does the video end? Where in the video should your welcomer start coming to the stage? You get the idea here. Talk through these things. Transitions are vital in creating a dynamic experience. 4. Know what you do well. What works at other churches may not work at yours. Know what you do well and do it well! Don’t try to be something you’re not. If you’re a more traditional style church, that’s fine, do it well! If you are band led with a concert feel, do it well! Be comfortable in who your church is. If you’re pastor is not a good actor, don’t have him act. If your worship leader is not a good prayer, find someone else in the band that can be great at that. Don’t add elements to your service flow that don’t make sense for your church or your context. Whatever elements you do land on, make sure you can do it well. Don’t be afraid to pull something if it’s not excellent. Too many times we are worried about being too sensitive to people’s feelings when it jeopardizes the whole experience for hundreds of people. I’m not saying don’t care, I’m just saying that sometimes there is a balance between disappointing one person and sacrificing the excellence level of your experience. Know what you do well and do it well. 5. Don’t tell them what’s coming. What’s the advantage of printing your order of service? Why do you do that? Is it the way you’ve always done it? Is it to give credit to the soloist and to show people the names of songs? Can I encourage you? – use your screens to accomplish this. You can use lower thirds or text on screen to let someone know who is singing. You can use lower thirds or full screen graphics to show the scripture passage your pastor is preaching from. Use social media or a small section of your bulletin to list the worship setlist so people can find songs if they want. You should definitely have some type of Production Sheet or Service Flow Rundown Sheet for all your on-stage leaders and your production teams. But an order of service for the congregation is becoming an old school way of thinking. If I’m honest, most of the time when I look at a printed order of service in church or at a local theater, its to see what’s left on the agenda before I can go home… “two more songs then we are done!”. I see a couple advantages to not telling your congregation what’s coming in your service. It creates anticipation. We all like a little excitement and suspense. Not knowing what’s coming in the service adds an element of surprise and intrigue. It cuts down on some printing costs. 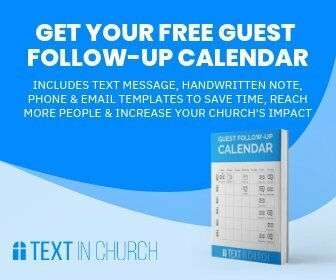 I would suggest still having a bulletin or service guide of some kind with your series graphic, a place for sermon notes, church announcements, links to your church social media accounts, and other things. But I would not include an order of service in this handout. 6. Have a structure so you can deviate from it. It’s okay to have a base structure of your service flow. Have a similar base format or flow to your services, so you can deviate from it when you want to. I would not suggest you change the flow in big ways every week. This puts a strain on your production volunteers as well as the whole team for knowing what’s coming next and executing it well. Plus, when you deviate from your structure it feels special or different. For instance, you could change your order in drastic ways for your Easter or Christmas services or other special occasions. Again, this creates excitement where people don’t know what’s about to happen and it creates memorable experiences. I hope these 6 tips help you as you are planning your service flow and creating weekly experiences at your church. What are other ideas you have for creating a dynamic service flow at your church? NextYou Say You Care About Volunteers, But Does Your Budget Agree? I’m confused. Whom shall I fear was an old hymn? Hey Erin, you’re right! I should’ve differentiated those songs a little better in the post. Correct, Whom Shall I Fear is not an old hymn. Thanks for catching this!